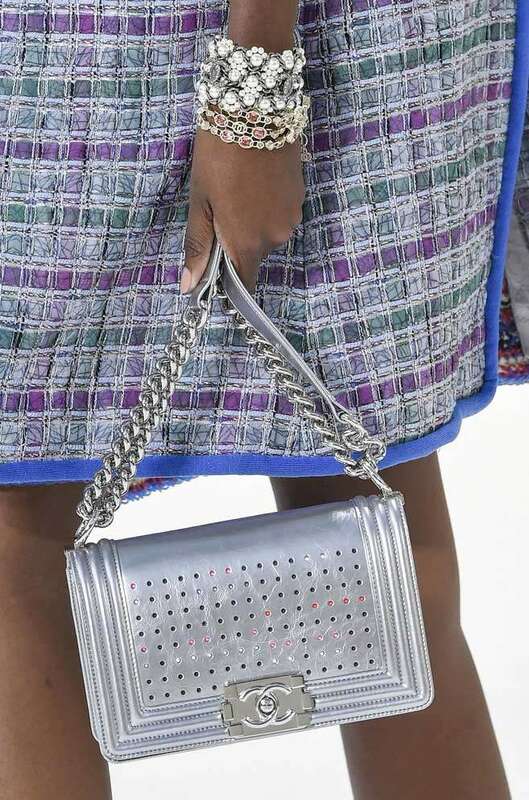 Chanel’s robots might have stolen the show at Karl Lagerfeld’s Back to the Future–style show this season, but the accessory of the moment will no doubt be Chanel’s LED-adorned bags. Clutches, cross-body styles, and the label’s infamously cool Boy bag were updated with LED dot matrices that flashed a trompe l’oeil quilted pattern and double-C logos. Clever? Yes, and quite salable considering the modern girl is as obsessed with capturing an Instagram-worthy moment on her iPhone as she is addicted with her phone itself. We’re betting Dolce & Gabbana’s light-up tiaras and shoes are popular, too. Chanel and Dolce & Gabbana are far from the first designers to light up clothing with some artificial glow. Way back in 1999, Alexander McQueen crafted an LED-embellished bustier for Givenchy’s Fall show, inspired by the looming prospect of the technological horror that Y2K was predicted to bring. Several years later, Hussein Chalayan took up the LED mantle, showing dresses that flashed cityscapes meant to convey an environmentalist message. LED shoes at Ashish followed, as did a glitzy frock form Richard Nicoll. The most resounding endorsement of glowing gowns, however, came at 2016’s Met Gala where both Claire Danes and Karolina Kurkova sported LED-dotted numbers that took the event’s tech theme to heart.